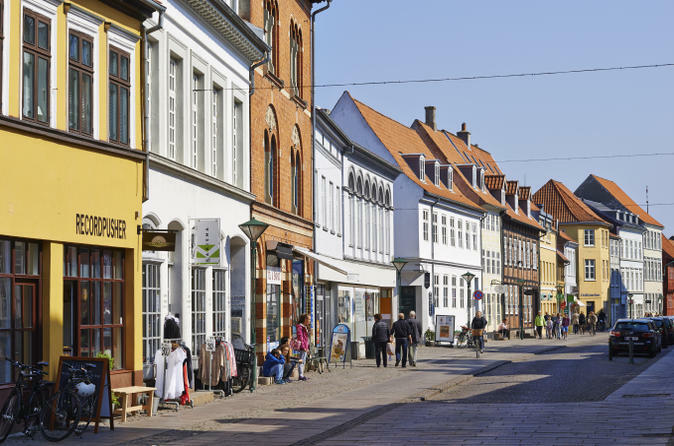 Delve into the fairytale world of Hans Christian Anderson on a full-day trip to Odense from Copenhagen. With a knowledgeable guide, travel to the influential author’s birthplace on the island Funen and gain fascinating insight into Andersen’s life in the museum dedicated the author. After browsing exhibitions in his former childhood home, explore the charming town and take a cruise down the Odense River to see its architectural array from a different perspective. Enjoy a complimentary lunch and glass of soda or beer on this tour. Depart from a centrally located pickup point in Copenhagen and relax aboard a comfortable, air-conditioned coach as your knowledgeable guide introduces you to the life of Hans Christian Andersen. Be reminded of timeless tales like ‘The Little Mermaid’, ‘Thumbelina’ and ‘The Ugly Duckling’ as you enjoy the scenic countryside of the journey. Cross the vast Great Belt Bridge to the picturesque island of Funen and arrive in Odense, the hometown of the legendary writer. Begin your tour with a visit to the Hans Christian Anderson Museum, the writer’s former childhood home; peruse a collection of exhibits that speak eloquently of the author’s life and work and see original drawings and poems. Continue exploring Odense by taking a walk down the ambient tangle of streets beside the banks of the Odense River. Arrive at Muke Mose, a verdant park, and climb aboard a boat to enjoy a leisurely cruise through the town. Revitalize with a sandwich and a beer or soda onboard and admire the scenic surroundings as you cruise. Return to dry land and stroll to your coach for the journey back to Copenhagen, where the tour concludes.